Relationship author Carmen Harra's new book: Find out what the relationship expert says about karma & its effects on relationships & love. 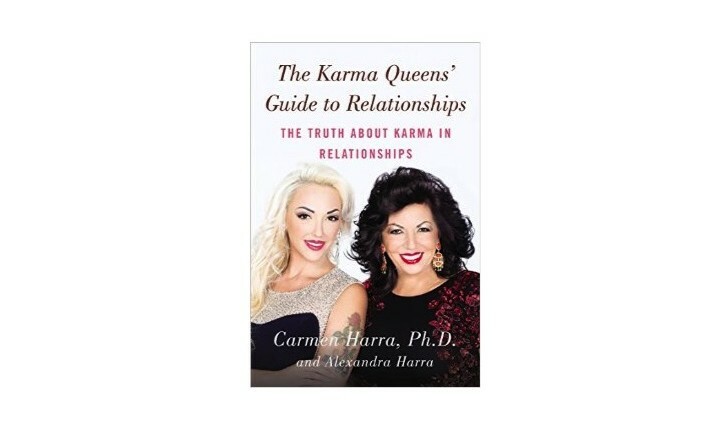 Licensed psychologist, relationship expert, and spiritual teacher Carmen Harra recently released a new love advice book that she co-wrote with her daughter, Alexandra Harra.The Karma Queens’ Guide to Relationships: The Truth About Karma in Relationships explores how karma affects our everyday life. From romantic relationships to the parent-child relationship, the relationship author stresses the importance of having strong and clean karma. Your book focuses on how karma plays a role in relationships and love. Can you explain karma to our readers? The concept of karma is considered to be the number one law of spirituality. As human beings, we are defined by our actions, our thoughts, and our intentions that translate into reality. We have individual karma, and we have family karma, meaning your intentions reflect in your family and in the people closest to you. I think karma is the foundation of the human bond, the foundation of human laws, the foundation of relationships. How do you work on karma to make sure it’s strong and healthy? Karma is something you can reverse, something you can work on. Karma is something that requires work. The more you are aware and the sooner you work on it, the better. The more you clean the karmic blockages, the sooner you can move your life in the right direction. If you feel that you have a block somewhere, you have to go and revisit you karmic pattern and understand where that blockage is. How does karma affect our relationships and love? All of our romantic relationships are karmically affected. Let’s say you’re raised in a dysfunctional family. You will have a very hard time creating your own family because all of those imprints will be stored in the subconscious mind. If you don’t work on that and you don’t acknowledge what has happened in your youth, then you will have a harder time creating a good family and a good foundation of your love life. When you think of the word “karma,” it is something that gets repeated. It’s like a memory that stays in your mind. Sometimes, it goes dormant, and all of a sudden it wake up, and it hits you. In psychology, it’s called dissociative amnesia. People tend to forget; people tend not to remember what has been done to them, but when you wake up that karmic pattern, you have an ability to erase it. So it’s good to revisit memories; it’s good to bring memories to the conscious level so that you can take them away and not let them hurt you anymore. If the mind has too much information and too many bad memories, it gets clogged. Every single relationship should be pure and should be unclouded of the negative karmic information. One of sectionsThe Karma Queens’ Guide to Relationships is about toxic relationships. How are you able to get out of a relationship that is more harmful than good? You need to uncloud any information that has existed, and in order to do so, you need to revisit all of your issues and make sure things are as simple as possible. One of the key things for relationships to function well is simplicity. That’s why my new article is about ways to detoxify dysfunctional relationships — we live with them, and we’re not aware of how toxic they can be. A toxic relationship doesn’t allow you to trust people; a toxic relationship doesn’t allow you to function at the best level of yourself — it’s like your soul is broken in pieces. You have to work on yourself to empower yourself. Sometimes, dysfunction can be an obsession and can create an obsessive pattern. What you need to do is replace your obsessions. A lot of dysfunctional relationships are based on an obsession. How many people are obsessed with the people they can’t be with? How you work with changing that obsession is the work of the mind. You need to reprogram, to rewire the brain. It’s an entire technique of rewiring the brain by eliminating all those obsessive behavior problems. You have to practice what is called self-care. It’s the fact that people ignore themselves; that’s why they become self-destructive. You attack yourself, and that has a lot to do with not being able to take care of yourself. There is something wrong with you, so the moment you practice that self-care, you have a chance of healing from something like that. You have to work on it on a daily basis. The neurons in the brain need to be creating new patterns of thinking. People go to the gym. What about working on the neurons in the brain to create the new paths of thinking? Relationships that are dysfunctional damage your well-being. If you don’t clean the toxicity and if you continue to live in the poor relationship, you will never be balanced enough or you will never be well enough at any level of your being, not even physically. They should be aware of the power of their own mind, the power of their own soul, the power of their own words, both written and spoken. If you start saying, “I’m not good; I’m not beautiful,” then you’re not empowering yourself. People should be aware that is part of the self-care and the self-empowerment. I feel like my book, personally, is kind of a manual. It gives you wisdom, and wisdom erases karma. I wrote all my wisdom throughout the years and then combined it with my daughter’s perception of the younger generation. We asked, “How can we make this right? How can we start having those wonderful relationships in which we celebrate the other people in your life? Is it possible?” Absolutely! With the right mindset, you finally can live in peace and joy and celebrate every aspect of your life. A book on relationships and love is about celebrating life! You can purchase The Karma Queens’ Guide to Relationships: The Truth About Karma in Relationships on Amazon.